The intersection of these two identities has become more acute thanks to Black Lives Matter and protests against the Trump administration’s executive order on immigration. A recent survey by Pew Research showed that almost 6 in 10 Americans believe Muslims face “a lot” of discrimination. Another Pew study found that while races differ in their perceptions of how anti-black discrimination affects achievement, nearly a third of white Americans believe blacks have a harder time getting ahead compared to 70 percent of black Americans. From Malcolm X to Muhammad Ali, America’s most famous Muslims are indisputably black. Yet the visibility of the nation’s native and immigrant Muslim populations have been erased due to the heightened fears of terrorism post-9/11. Since the attacks, Muslims of Arab descent, especially men with turbans or women with hijabs, have borne the brunt of anti-Muslim rhetoric. President Trump’s executive order created panic among Muslims from seven majority-Muslim countries. For Somali- and Sudanese-Americans, who come from two of the three African countries on the list, anxiety may be particularly acute. These communities are primarily based in Midwestern cities that have already been subject to heightened scrutiny from the Trump administration over claims of extremism and violence. Minneapolis has the largest Somali-American population in the country while Chicago boasts a large Sudanese-American community. Despite their rapidly rising immigrant populations, both cities remain highly segregated and have been national focal points in high-profile cases of police brutality and institutionalized discrimination. In March 2015, Hazma Jeylani, a 17-year-old Somali-American, was stopped under suspicion of stealing a car. In the smartphone video capturing the arrest, a Minneapolis police officer threatened to break the teenager’s leg. In 2002, the city’s Somali community was outraged following the police shooting of Abu Kassim Jeilani, a mentally ill Somali man. President Trump has been outspoken in his views on both cities. Last November, Trump visited Minneapolis and said some Somali migrants there, “[are] joining Isis and spreading their extremist views all over our country and all over the world.” Such statements from the nation’s highest office raised alarm bells for black immigrant Muslims, for whom problems with urban policing are married to increased scrutiny of immigrants. The realities of being black in America leave immigrants with no doubt about their identity in America. 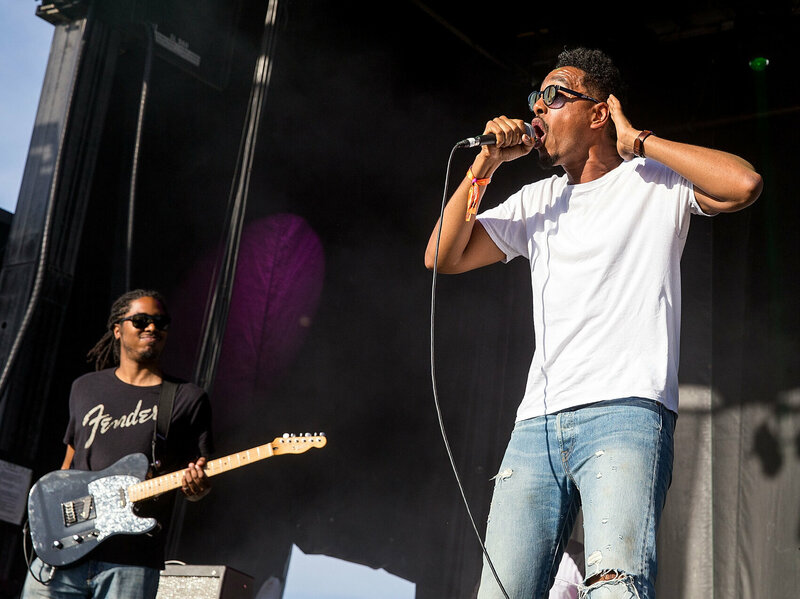 “I think that when many of the older generation come here, they realize that if they don’t identify as black, America will do it for you,” says Oddisee. “When my father moved to Prince George’s County, a predominantly black area, when my neighbors looked out the window, they saw a black family.” Somalia and Sudan have a complicated relationship with race on the fault line of racial consciousness because they straddle the border between Arab and black Africa. 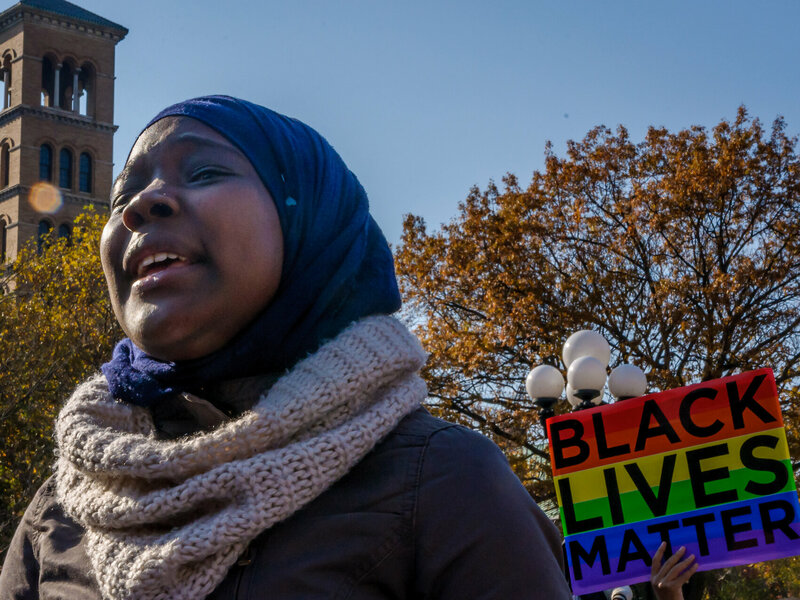 Daad Sharfi, a Sudanese-American student at Yale University, lives in Albany Park, one of Chicago’s most ethnically diverse neighborhoods. Although her immediate family was naturalized during the Obama years, many members of her extended network are permanent residents or visa holders vulnerable to the consequences of the administration’s executive order. “I am an immigrant and I have always been surrounded by immigrants and asylum seekers, so this attack on migration was personally very disheartening as it jeopardized my community and the entire system through which my family was able to enter the U.S.,” she says. After the Ninth Circuit Court refused to uphold the administration’s immigration ban, the future for black Muslims of immigrant descent remains uncertain as the Trump administration issues a revised executive order. However, individuals like Sharfi and organizations like CAIR are gearing up for a fight. On her part, Sharfi plans to pursue a career in immigration law following her graduation from Yale in May. Mohamed says CAIR will continue to engage in civic education and policy advocacy, leaning on powerful advocates including Rep. Ilhan Omar, the first Somali-American legislator in the United States and Rep. Keith Ellison, who represents Minnesota’s 5th district, which includes Minneapolis. This entry was posted in Immigration, INTERNATIONAL, Race and Politics, Religion and tagged American Islam, Black Muslims, Racism, Somalia, Sudan. Bookmark the permalink.